In this case the valve lag is 40°. The number of degrees of crankshaft rotation after a piston passes the top or bottom center of its stroke, at which the intake or exhaust valves open or close. For example, if the exhaust valve closes at 60° of crankshaft rotation after the piston passes over the top center and starts down on its intake stroke, the exhaust valve lag is 60°. 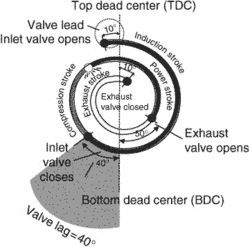 This delay, or the valve lag, enables the momentum of the mixture to add to the weight of the charge, or the momentum of outgoing exhaust gases to pull more exhaust from the cylinder, thus increasing volumetric efficiency.